So, last year I was introduced to Sock Madness. Sock Madness is an annual event, held on Ravelry. The madness starts in March, and runs through late May/early June every year. It is a seven round competition. All the patterns are mysteries, and usually increase in complexity as the competition progresses. Before the start of the competition, a list of yarn suggestions/requirements and notioins for the patterns is released. Last year, notions included 14 buttons for one sock pattern, and 2 4" zippers for another pair of socks. Before each round, the pattern specs are released to the group (handpaint vs solid, single yarn vs multiple colors, etc) and within 48 hrs of the spec release, the mystery pattern will be released. For the first round, there are no teams. A competitor must finish the pair of mystery socks within 14 days of the pattern release in order to continue on to the next round. Thereafter, all competitors are assigned to a team. Each round after the first, the fastest knitters to complete the pattern continue on, with fewer and fewer making it to the next round. For the final round, the faster knitter from each team is competing representing their team for the win. The teams are assigned based on level of knitting experience and relative speed of the knitter. This way, the slower and less experienced knitters are competing against each other and the blazing fast experienced knitters are competing against each other. Last year, there were around 300 competitors. This year, over 500 signed up, from all over the world. In round one, if a competitor fails to complete the socks in the allotted two weeks, but finishes one sock (or through the heel turn if knitting TAAT), while they can't continue in the competition, they do get all the patterns for the rest of the rounds. Last year, I made it to the fourth round I think. I got behind and disqualified on that round, as I was travelling to Ireland for a CME conference and got bumped. I learned lots of new techniques, including how to make a zipper a knittable object, and a new type of heel. The first pattern for this year's competition was released yesterday morning. Since I know I have time, I'm not sweating these. I cast on first on double points, then frogged that and went to TAAT on two circs. I like doing my socks TAAT if at all possible, because whatever I do to one sock that way (including minor changes in gauge), happens to both socks at the same point, so they feel the same while wearing them. In the Ravelry Sock Madness group, there is a thread for the Treehouse, where members waiting for the next round go to relax and "play" with each other (virtual playground), there is a story line in another thread that is contributed by many. There are cheerleaders and prizes and good friendships, along with knitting learning. The designers really outdo themselves to come up with something new, unique, challenging and playing field leveling for this competition, and the moderators, Julie and Zemy, are amazingly awesome! Let the madness begin, and I hope to get one round farther than last year! 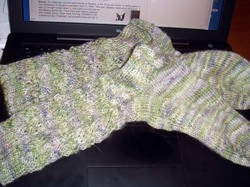 Back in 2009, I did a test knit for Anne Podlesak of Wooly Wonka Fiber for socks. These were knit from alpaca, dyed with logwood. The design was done for a fiber farm, Long Ridge Farm (Earthues Natural Dyes) using their fiber, dyed with their dye. Anne retained the rights after the first year to the pattern, but I cannot find it on Ravelry, Anne's design page or Wooly Wonka Fiber page. These are incredibly WARM socks, and I love the leg design with a decreasing scale on the cable/travelling stitches. I knit them up quickly as the test knit, then re-knit the feet as I was too loosely-goosey on the original knit for my taste. The re-knit has sat on needles for three years. With Ravelry's Sock Knitters Anonymous August challenge being to free up needles, I took this to heart and finished these up the first night after I took on the challenge. I love the color, and given my recent foray into dyeing with plant dyes, it is fitting that these should be the first sock UFOs to get completed. At least a couple more installments will be forthcoming on the Gilead Fiber Farm dye weekend - Indigo and plant dyes. Maybe even some mushroom stuff. Over the past couple of years, I have come to be a hard and true fan of Anne Podlesak of Wooly Wonka Fibers. I was introduced to her fibers through the knitting Gale by Anne Hanson of Knitspot and through joining the A Change of Seasons lace club that Anne offered last year. During SKP2008, one of the patterns selected for the pentathlon was Anne's Rattlesnake Creek socks, which I am doing in my Pumpkin Juice Happy Hooves batt from Enchanted Knoll Farms. 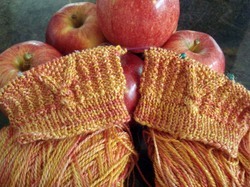 I recently saw Anne's post about socks she is designing for Nancy of Long Ridge Farm. Nancy does natural dyeing, and the yarn used for these socks is Logwood, in a sport weight. As such, they knit up very quickly. Nancy will be selling the pattern in kits with her yarns. I fell in love with Anne's pattern immediately and offered to be a test knitter for her. She took me up on it, and I started Tuesday knitting on these socks. Even with working a full time job, I am almost done with the first sock. And I LOVE these socks, and the color, and the yarn. With this sort of enjoyment from a project, I know I will have separation anxiety when I finish these socks, but then I get to enjoy wearing them! Rattlesnake Creek is a free pattern (more details available on Ravelry) which was featured as the third pattern last year in the Sock Knitters Pentathlon. I started them, but with all the cables, wound up breaking two of the Size 0 double points I had been using. They got set aside pending my remembering to replace the needles. The breakage I contribute to the tightness of all the cables, not to a defect in the needles. After I complete the Orange Mystery Socks, these will be up. Way back in September, I cast on the Sock Knitters Anonymous Ravelry group's September mystery socks. I've enjoyed the mystery socks so far, and haven't been burned by having a pattern I ended up slogging through. September's requirement was yarn that was 75% orange (preparing for Halloween?). I didn't get very far before setting them aside for Christmas knitting and life in general. In keeping with my wish list earlier in the week, I'm gathering up the WIPs I can find and seeing if I can get them done. This is the first such project with lots of traveling stitches. Yarn: Harmony sock yarn from The Woolen Rabbit in color "Calendula"
With Christmas rapidly approaching, but with the week of Christmas off this year (first time ever), it dawned on me finally that DS2 (Kille's brother Beta)'s girlfriend is joining us for Christmas for the second year. That would seem to indicate the relationship is weathering well, and thus entered the dilemma. I've knit stockings for everyone in the family now - two I've even designed myself. SO, I always assumed that when the kids got married, I would be knitting stockings for my children-in-law (is that a word???). I finally asked KB beta if it was time to knit a stocking for Jenn. She is a lovely young woman, smart (just finishing her master's), hard working (has put herself through school), and charming. Certainly the type of woman I would be honored to have as a DIL one day. However, there is the superstition of knitting - the boyfriend sweater curse. There has been a bit of fear on my part that if I were to knit Jenn a stocking I might discover that there is a stocking curse as well. I finally decided to get over that, and asked KB beta if it was time to knit Jenn a stocking. His response was "I like her. I think I'll keep her." And so, a new stealth project was born in time for the Webs sale on stocking kits. This will be knit on 2's and 4's. The apple green is inside the cuff. The leg will be white with green. Foot/heel/toe will be the red-violet with the medium blue, and there will be about three rows on at the base of the toes which include the bright red. Pictures to follow as I cast on tonight or tomorrow. KB beta arrived Sunday. Kille finished finals Wednesday, but waited until Thursday to return home due to weather, playing with friends, getting a school tuba to practice with over break, etc. Jenn (KB beta's girlfriend) will arrive Monday. Since KB beta lives in NC, and Jenn lives in MD, I've gathered wool sweaters, wool socks, and the odd assortment of caps and mittens I've made over the years for them to use and keep warm. We are expecting some single digit temps over the next week, and hopefully several days of snow. Christmas doesn't seem like Christmas to me without the snow. Hope everyone's stealth knitting is staying fun, not stressful. Merry Christmas! Stealth knitting progresses. Tape measures, EZ pithy instructions, Spunky Eclectic Grinch colored yarn, four kids, one son's girlfriend, Christmas season..... stealth knitting is at hand. The rest of the story will have to wait until after Dec. 25 for FO photos (perhaps even modeled), and project specifics. I hope your stealth/gift knitting is progressing stress-free and warmly. Suffice it to say that with four children and a potential DIL, I am using one garter ridge in a CC for DS1 (Kille's Brother Alpha), two for Kille's brother Beta, three for Kille, and four on Kille's brother Gamma's rendition. The potential DIL (KB Beta's girlfriend) is joining us on Monday for ten days, so her rendition may go with just that section being straight Grinch Red (a color custom dyed for me for these projects by Amy. I've been in love with the Grinch colorway since Amy first offered it last year. I've used it on my own Christmas stocking knit earlier this fall, and now these stealth projects. These are in the Supernova sport weight..... very soft and stretch. In reality, the red is a bit deeper in hue than it photographed - a very lovely Christmas red indeed. As noted above, I will post the specifics once Christmas is opened, just in case any of my offspring read the blog. Ravelry. What can I say? It has so many groups, one would be hard pressed to say there wasn't anything there to be interested in. One of the ones I've enjoyed a lot this year is the Sock Knitters Anonymous group. Every month there is a challenge. Each challenge has choices. For instance, this month has three choices: orange socks, a Cookie A pattern, or orange Mystery Socks. Mystery Sock patterns appear on alternating months. I've gotten to where I work both socks simultaneously on two sets of needles for these so I get them done by the time I've completed the last clue. I've liked them all, with one exception that I identified I wouldn't enjoy it before its release, so no harm done. So, I'm going for the Mystery Sock challenge, using Harmony sock yarn from The Woolen Rabbit in "Calendula" colorway. Kim's yarns always have a depth of color that is pleasing to me, and unlike anything I've found elsewhere. Pure joy to knit with the stuff visually and tactilely. As a member of Harmony Semi-Solid sock yarn club from the Zen Yarn Garden , this wool/Tencel blend (Tencelicious) in "Sun Kiss" was March's selection. The pattern, Ribs & Seeds, was designed for Zen Yarn Garden by Alyson Johnson, and was included with the yarn. Reading the inspiration for the pattern, hot peppers with "ribs and seeds removed", I decided the yarn color reminded me of a ripe habanero pepper and I would use the yarn for the Ribs & Seeds pattern. They seemed to fit together. This is the first time I will have knit socks from a wool/Tencel blend. I am curious to find out how they feel and how dry they keep my feet. It took a couple of inches of the seed rib pattern to take shape and make itself apparent. I am loving the cabling with the seed stitch center! My last pairs of socks have gone rather quickly - averaging eight days or so, including down time for being too tired from work, life interfering with knitting, etc. I suspect these with all the cabling, and the seed stitch, will take longer, but the texture is nice, and a welcome change from what I have been knitting. Done! Another pair of socks - my fourth this year, and third since the beginning of March. A far faster pace of sock production than in my past - I think I have Margene's missing sock mojo up here in Maine! LOL Clearly, the more I knit socks the faster they become, regardless of toe up, cuff down, heel type or toe shape. And I've cast on the next pair, with many many more in queue waiting for their turn.